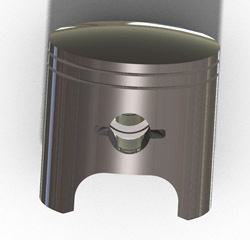 The piston's main task is to convert combustion energy into mechanical energy. During this process, substantial pressures exerted on the piston create high rigidity and temperature-resistance demands. Ever rising power density, reduced emissions, low noise and more efficient fuel and oil consumption - these are the chief challenges facing today's engine designers. For the pistons built into these engines, these challenges translate into maximum strength combined with low weight. To meet these challenges, PAC/Rightway has further advanced the NASA piston technology and achieved an increase in endurance strength for significantly less weight. 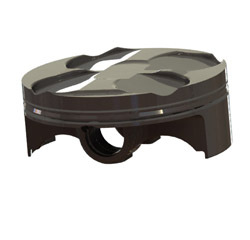 This technology is being used in many OEM pistons for many high performance engines. Among these NASA alloys, MSFC-358 has the lowest Si and is specifically designed for applications that do not demand high-wear resistance and low thermal expansion characteristics. Applications for NASA-358 include cylinder blocks (with Ni composite for wear resistance), cylinder heads, heat exchangers, turbo chargers, etc. Our aftermarket customers benefit from our proven expertise in engineering and manufacturing original equipment (OE) components. We're an international producer of engine piston products, so we understand the importance of OE fit and form replacement parts. With respect to reliability, flexibility and meeting our deadlines, we treat our original equipment and aftermarket customers the same. For engines that are becoming more and more complicated and complex, we offer our aftermarket partners quality services that are appreciated and highly The use of patented NASA aluminum alloys enables us to make aftermarket pistons that are superior to the OEM products.